The American 331 East 86th St. The Gracie Sq. 451 East 86th St. The Midtown 220 East 70th St. In 1945 the following classified ad ran in the New York Times, 25 Nov. 1945, pg. 133: "86 St. 331 E (American Hotel, just opened). Running water, adjoining bath; daily rates only; singles from $3, doubles from $5." I have not been able to discover the name(s) of the individual(s) who organized these three small hotels on Manhattan's East Side. Each seems to have been a row house, turned into a hotel late in life. Of the three, only 331 E. 86th St. exists as of July 2016. The others have been demolished. All three hotels existed as such by 1949, and they continued to be listed in the Manhattan telephone directory through 1981. The Midtown Hotel disappeared in 1982. The Gracie Square in 1988. And the American Hotel in 1992. 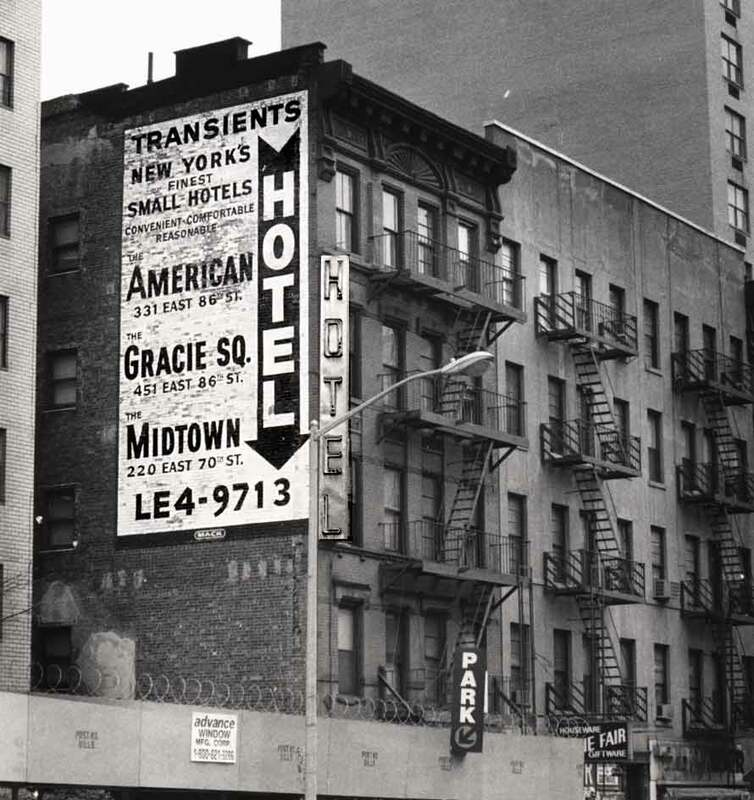 The 31-room Gracie Square Hotel was described as "now vacant" in a story in the New York Times, 11 Oct. 1987, pg. A9. Two classified ads in the New York Times in 1989, offered 331 W. 86th St. for sale, "For Sale - Hotel / 331 E 86th Street Ideal for bed/ / Breakfast facility - Peter Trent V. P. / 212-891-7230 / Douglas Elliman Commercial" (19 Nov. 1989) and "SRO / For Sale / 331 E 86th St. / 39 rooms - can deliver vacant for new / construction. Contact: / Peter Trent V.P. 212-891-7230 / Douglas Elliman Commercial" (20 Dec. 1989). This sign was painted by the Mack Sign Co. approximately 1974. For much, much more on the Mack Sign Co. see Walter's 14-to-42 website.